What Temperature Should Your Sparge Water Be? How hot should your sparge water be? You would think that this information could be dispensed with a single number, but at the homebrew scale, it’s slightly more complicated than that. Your sparge water should be heated so that your grain bed remains at 168–170 °F (76–77 °C). A little over in the early stages of sparging doesn’t hurt. 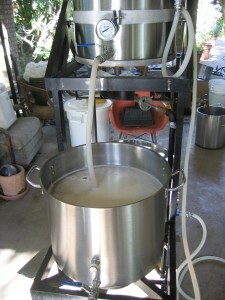 In all-grain brewing, after the grains are mashed, the wort is run off to the kettle. To ensure that as much of the sugar is recovered from the grain bed as possible, it is rinsed with hot water. This water is called sparge water. Sparge water is heated because hot water dissolves sugar more effectively than cool water. However, if the sparge water is too hot, it will dissolve not only sugars, but also tannins from the grain husks. A small amount of tannins are present in any beer. However, in excess, these tannins cause an astringent mouthfeel to beer and are unwanted. 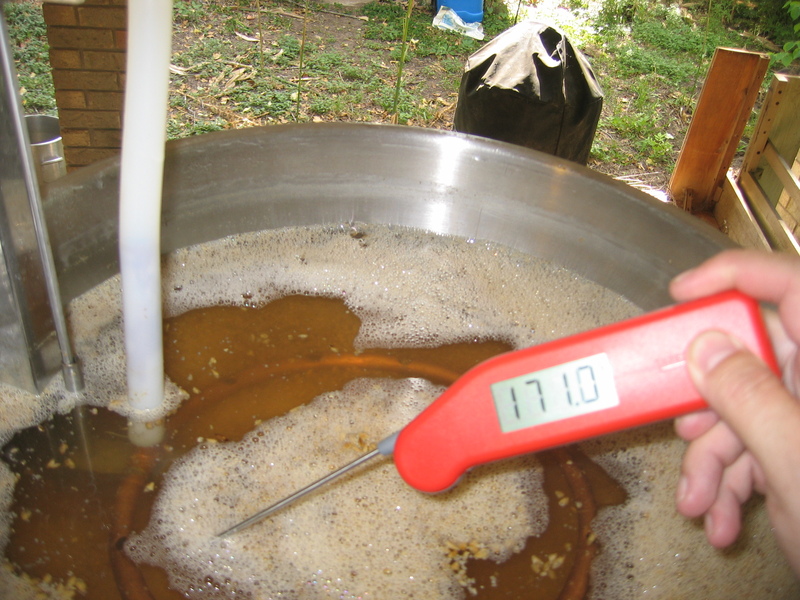 When sparging is discussed in the homebrewing literature, the appropriate temperature of sparge water is invariably given as 168–170 °F (76–77 °C). This is also the value seen in the professional literature. In a commercial brewery, if the temperature of the grain bed is over 168–170 °F (76–77 °C) at the end of wort collection, there will be too many tannins in the wort. So in one sense, 168–170 °F (76–77 °C) is the correct answer. From a practical standpoint, however, it pays to understand what is going on in your home brewery when interpreting this number. Vessels in homebreweries lose a lot more heat than those in commercial breweries, largely because of their comparatively small size (and consequently greater surface-area-to-volume ratio). 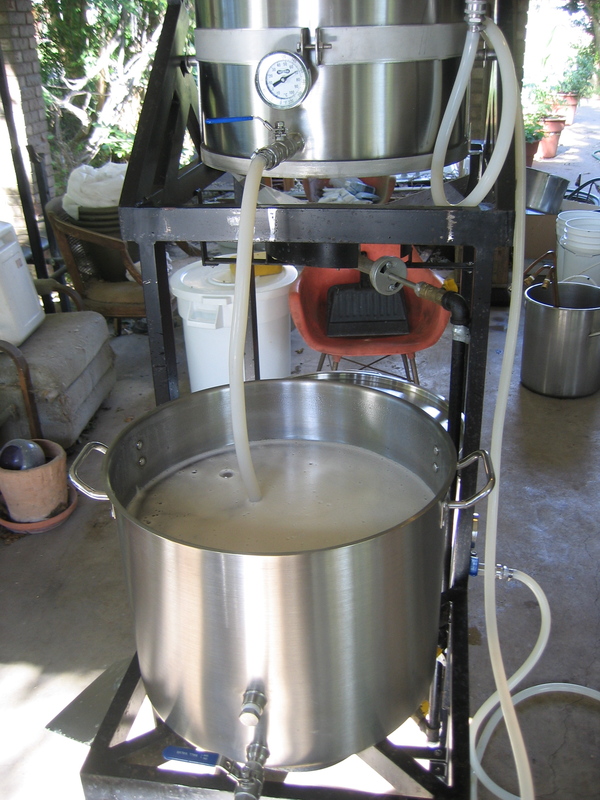 In a homebrewery, transferring water from your HLT to your lauter tun likely involves having it flow through relatively narrow tubing, then to a sparge arm. Homebrew lauter tuns are almost always open at the top and, due to this and their size, can lose considerable amounts of heat from the top of the grain bed and from the sides of the vessel. If your sparge water is 168–170 °F (76–77 °C) in your hot liquor tank (HLT), it will likely be significantly cooler when it reaches the grain bed, which itself will be cooling as sparging proceeds. This — near the end of wort collection — is the point at which you do not want the grain bed temperature to exceed 168–170 °F (76–77 °C). To discover this temperature, you need to measure the temperature of your sparge water and the temperature at a few points on the top of your grain bed, while brewing. Over a few brewing sessions, experiment with heating your sparge water to different temperatures. By trial and error, you will discover the value that applies to your equipment. While experimenting, keep in mind that going over 168–170 °F (76–77 °C) at the top of the grain during the early part of wort collection is not a problem. (Consider that part of the grain bed is boiled in decoction mashing.) It is near the end of wort collection that you want the temperature of your grain bed to be 168–170 °F (76–77 °C), or a few degrees below. Near the end of sparging, the pH of the wort left in the grain bed will have climbed from 5.2–5.6 to 5.8. Tannins are more easily extracted from grain husks at higher pH values, so it is at the end of sparging that not exceeding 168–170 °F (76–77 °C) is the most important. Heating your sparge water so that your grain bed maintains a temperature of 168–170 °F (76–77 °C) throughout wort collection— or climbs to that temperature if you didn’t perform a mash out — will improve your ease of lautering, because sugary solutions are less viscous at higher temperatures. You will also likely increase your extract efficiency. I think the importance of hot sparge water is overrated. Just yesterday I cold sparged again, because I forgot to heat sparge water, and I had no trouble hitting my usual efficiency of 85%. granted, I’m batch sparging but I think even for fly sparging it should not matter all that much. I also think that the temp limit of about 76 C comes from the fact that brewers should not inactivate a-amylase during lautering and not so much the risk of tannin extraction as believed by many home brewers. How does the use of warm or cold water influence the efficiency of sparging guys? Why should brewers not inactivate a-amylase during lautering ? If all amylases are inactivated during lautering any starch that is released during this process may not be converted and can lead to a starch haze in the beer. Starch may be released due to mechanical action of stirring or simply by a rise in temperature. Many homebrewers believe that a mash-out is designed to deactivate the a-amylase, but that’s not the case. Then what is the purpose of the mash out? You should start sparging only when all of the starch is converted to sugar. The whole reason of conducting an iodine test is to ensure there is no starch left in the match, at which point you need to raise the temp to mash out to deactivate all enzymes so that they don’t continue breaking down other (non-sugar) compounds during the lauter.